Why am I tripping out? I'm hacking away at my patient and I go to get a different scalpel because I dropped my old one down behind his lungs. Suddenly, my vision starts freaking out, and everything turns all green and purple. What's happening and how do I stop it? You accidentally stuck yourself with one of the syringes. Specifically, the green one. While in this state, stab yourself with the other syringe (the blue one) to stop the effect (good luck telling which one's blue in this state). The syringes have more of an effect than just drugging yourself though; if you stab the patient with the green syringe, the bleeding rate slows down. Likewise, if you stab them with the blue one, the rate goes up (why you would want that, I have no idea). 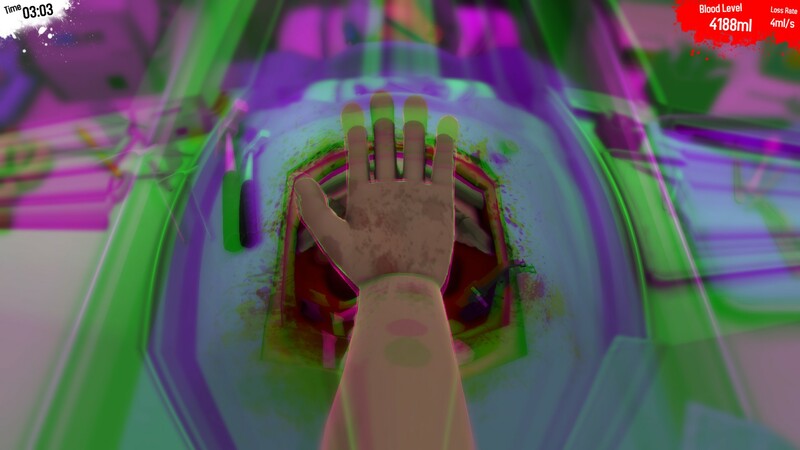 Also, if you do manage to complete the surgery in this state, you get an achievement. Good luck. You stabbed yourself with one of the syringes, its located near the scalpels. There are achievements related to performing surgeries while drugged by the way. Not the answer you're looking for? Browse other questions tagged surgeon-simulator-2013 or ask your own question. How do I electrocute myself? Why has my screen turned weird in Surgeon Simulator Mobile? How to figure out and find secret alien surgery?